Will Women Lead the Environmental Health Movement? How can we imagine that ordinary people might be able successfully to challenge the overwhelming internal logic of the global economic system because of concern over environmental health? There is an Ethiopian proverb that when spider webs unite they can tie up a lion. The lion of the globally destructive patterns of production and consumption may one day be ensnared and ultimately domesticated by the gossamer webs of human consciousness and community action. What will happen when ordinary people, whose lives are often mortally wounded by the destruction of the biosphere, come to understand that their wounds are so often intimately related to the wounds of the earth? What will happen when a working woman comes to the realization that her own breast cancer, her husband's lymphoma, her brother's melanoma, her son's learning disability, his best friend's attention deficit disorder, her daughter's endometriosis, her niece's cleft palate, her cousin's chronic anxiety and panic disorder, her best friend's severe chemical sensitivity, her best friend's daughter's asthma, her uncle's infertility, her neighbor's son's testicular cancer, and her sister's daughter's childhood leukemia may form a pattern? What will happen when this working woman begins to understand that these new human pandemics that effect her community and her family directly may be profoundly connected to what is happening to the fish in the sea, the birds in the sky, and the animals of the earth? I believe this working woman will understand that the cancers and infertilities of the fish, the disappearance of the frogs, the cleft palates of the mice, the shifts in gender orientations of the birds, the susceptibility to viruses and infections of the seals, the disappearance of the song birds--that all of this and much, much more may be telling us a story that is also our story. The story that the birds and the fish and the mice are telling us is the story of inter-being; the story that all life and earth is truly, breath-takingly, concretely connected right now, and that what we do to the mice of the field, and the birds of the sky, and the creatures of the forrest is also, ultimately, what we do to ourselves and to our families right now. I do not believe that we can hide from this story much longer. It is one of the great stories of our time. The very human protest against the massive, entrenched, and toxic system of global production and consumption may seem unrealistic economically and politically, but is it any less realistic than the Quaker protests in Europe and the United States that played such a key role in ending the 350 year-old slave trade? I do not invoke the parallel to ending the slave trade lightly, for we are as enchained by toxic chemicals, and by ozone depletion, by climate change and the destruction of nature as we once were enchained by slavery. I believe that environmental health may be one of the greatest human rights issues of the new millennium, and thus our biggest challenge. 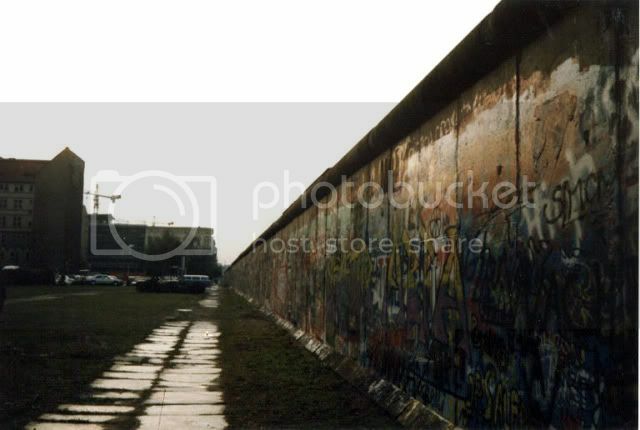 Memories of East Berlin and the Fall of the Wall - Has it really been 20 years?! Twenty years ago this month I was living in Munich, Germany. I can hardly believe that it's been twenty years--it makes me feel so old! Because in many ways, my memories of those six months in Munich are clearer, more vibrant, more joyful than most of my other high school memories all together. 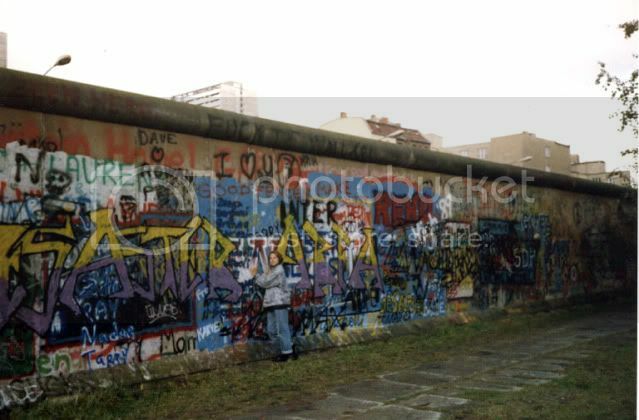 One week before the Berlin Wall came down, my class took a field trip to Berlin for the week. Most of the time was spent in West Berlin, naturally. After living in Munich, I was less impressed by Berlin. While Munich was clean, friendly, and safe, Berlin felt much like any other city--busy, dirty, impersonal in many ways. We stayed in a youth hostel and dyed each other's hair with henna. We gawked and the McDonald's on the corner (I don't remember any McDonald's in Munich) and got lost in the subway which, unlike Munich's U-Bahn but like every other subway I've ever visited, was dark, somewhat dirty, and smelled of hot metal and old urine. As a class, we had permission to visit East Berlin for one day. We gathered at the checkpoint where East German guards with machine guns checked our passports and issued us one-day travel visas. Strangely, East German visas were not stamped into our passports directly, but onto small sheets of paper which were slipped between the pages of our passports to be collected by the guards on our way out. We were also required to change 20 West Marks into East Marks, and we would not be allowed to keep it, or change any of it back on our return to the West. There would be little evidence of our trip to bring home. Once inside, it was like we had stepped through the looking glass into a city from the past. A grey and dirty past. Our clothes and hair were conspicuous for their style, color, and flair amidst so much that was drab and worn. 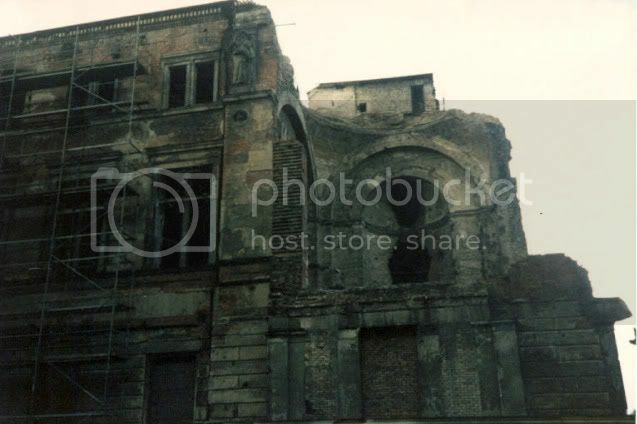 The buildings were crumbling and dreary, and many structures that had been bombed during WWII still stood in ruins, their crumbling holes like gaps in a mouth full of rotten teeth. We instinctively lowered our voices as though we were intruders in party dress who had found ourselves accidentally crashing a funeral. We had all day to spend our money, but there was next-to-nothing to buy. We tried some coffee, but it was bitter and impossible to finish. Several people curiously bought East German cigarettes for the novelty of it, only to hack and spit furiously with the first puffs, shaking their heads in disgust. Most packs were given to hopeful-looking East Germans hanging on a corner eying us cautiously. A couple were kept as souvenirs. We toured a ceramics factory where I bought a single blue-and-white mug for my mom, mostly because it had some aesthetic appeal and the words "Made in East Germany" were printed on the bottom. Little did I know the historic value those words would soon have! We passed several parking lots full of the East German Trabants: cars we called "Trabis". It was surreal to see lots full of a single kind of car, and streets lined with them, end-to-end in varies states of disrepair. Many shops were closed, or only had a few items left on dusty shelves. East Germans we passed on the street kept to themselves, speaking in low, hurried voices with strange, muted inflection. There were no raucous, laughing groups of youngsters or kids on bikes, or street vendors or musicians. It was unnaturally subdued and grim. The day dampened all of our spirits. It was oppressive just to have to stay for the afternoon. After choking down a cardboard lunch, we huddled together to count our change. Many of us still had too much left over, and nothing we wanted to buy. One of my classmates noticed a few people sitting on the sidewalk outside the grocery. They looked even more bedraggled than many we'd passed and several of us decided that we would offer them the change in our pockets--they certainly had more need of it than we did! Their reaction was heartbreaking--such gratitude and honest surprise. One woman had tears in her eyes. I couldn't imagine living in this dusty, hopeless twilight world. A few hours had passed and yet, as soon as we passed back through the checkpoint into the West it was like walking back into the sun after spending the day in a dark theater. We all found ourselves breathing easier, blinking as though we were just waking up, laughing again, shaking ourselves to get rid of that close, oppressive feeling. But the taste of that afternoon stayed with us. I can still taste it, bitter on my tongue, dry and crumbling like rotten plaster and rusting metal and old dust. A week later, back in Munich, we got the news that the Wall had fallen. Friends called their families all over the world, laughing and crying at once. Celebration and disbelief swept the city. Trabis rolled into town, and there were stories on the news of people burning them in celebration. East Germans began to appear in Munich in little, hurrying knots. They were as conspicuous on Munich's city streets in their drab, out-dated overcoats and bulging bags as we had been in East Berlin. Their voices were still hushed and toneless, and the children gawked shyly at everything and everyone. It was not just the end of an era, it was also the beginning of something new and overwhelming. I was too young to appreciate the enormity of it all, but I have been forever grateful to have been there during those pivotal months. I still can't believe it's been twenty years, though. Twenty years--einen augenblick! Note: For something a little lighter, check out this 1960's commercial for the East German cars that were so hated when I was there in 1989. My German is rusty, but among other things, they claim that the car is maneuverable, fast, and tough--what a joke! It gets harder and harder to read the news. Global warming, peak oil, overpopulation, global food crisis, water shortages, deforestation, depletion of natural resources: the problems we face are overwhelming and the damage seems impossible to stop, never mind reverse, without massive global cooperation which does not appear likely. I look at my kids and I wonder what their lifetimes will bring, and how long before the struggles consuming so much of the world reach them, too. So when my friend Rhamis showed me what he's been working on with Geoff Lawton (including work on the world's first carbon-neutral city) it seemed almost too good to be true. For the first time in a long time I think that there might be a solution--an idea that solves problems without creating new ones-- and that possibility gives me hope again. The more I read and watched the more excited I got, and I couldn't wait to pass it on. Permaculture might just be a big part of a sustainable future for us all. Yesterday we had a unique opportunity to introduce the kids to the political process up close and personal: Barack Obama was scheduled to speak near my parents' house. For the first time in my voting life, it would seem that all of the my family--Democrats, Republicans and Independents alike--are all enthusiastically pulling for the same candidate in the upcoming Presidential election. So, when I brought up the idea of attending the rally to my parents, and they brought it up with my grandmother, everyone agreed it was a good idea. Neither my parents nor the older two children had ever attended a political rally before, and the realization that we could have this first together made it even more special. It took some doing to get enough tickets, to figure out what and how to pack, and to organize the outing all together with three small children, but it was worth it. Security was tight, with metal detectors and swarms of Secret Service, but much more thorough and efficient than airport security, so the line moved pretty steadily. Once inside we staked out a spot along the rope line and settled in for the rest of the wait. The clouds were hanging low and threatening rain, but the crowd was undeterred. The event was sold out and there were crowds of people without tickets waiting at the gate for the chance to hear him speak. The atmosphere was so positive and friendly and excited--it was a great introduction for young and old alike--and the tone was unfailingly up-beat. There were lots of families gamely braving the wet, too, even without seats or diaper bags. When Barack was finally announced the crowd cheered even louder as the rain began to fall. Unfortunately, by that point Lexi and Spencer had had enough of standing around and listening to adults "speechifying" and were ready to go. They had their buttons, they'd seen Barack, and now they were done. My mother selflessly offered to take them home and feed them lunch (long overdue at this point) while Dad, Gram, Ellie and I stayed to hear him speak. He did not disappoint. He did not cut short his speech or stand under an umbrella. He stood in the weather with us and connected. Before long, the rain stopped and Ellie got down to romp in the damp sand with the other little ones while we listened. In spite of the weather and the long time spent on our feet, it was a great event! Friendly Hispanic Voice: Hello! May I please speak to Paulo or another household member 18 years or older? Me: Paulo's not available, but I am over 18. FHV: Would you be willing to answer a few questions? I am not selling anything. FHV: I am calling to conduct a brief survey of Hispanic households in your area. This survey will only take a few minutes of your time..
Me: Excuse me, but no one in this house is Hispanic. Paulo is Portuguese and I'm a mutt. FHV: Well. Is anyone there religion? FHV: And you are over 18? FHV: Would you mind answering a few questions for us? It would only take a few minutes of your time. FHV: Would you prefer to answer these questions in Spanish or English? Me: English, since I don't speak Spanish. FHV: And you said that you are not Hispanic? FHV: Well thank you very much for your time and have a nice night! This has been making the rounds, but if you haven't seen it yet, here it is. Priceless. Oh, this is priceless! It's just as incoherent as the real interview, but fabulously funny instead of cringe-inducing! Say 'Hello' to Cuppa Invader Palin, my catchy new moniker. At least, that's what my name would have been, had I been born in the Palin family (shudder). How do I know this? Why, the Sarah Palin Baby Name Generator told me, of course! Go ahead: find your alter ego. It's better than crying or spouting obscenities every time you hear her name. I needed a laugh today. So little sleep, so much to do...and as usual, Jon Stuart delivered. No offense to my Republican friends (you know I love you, too), but it was just what I needed after last night. Ah, yes-- a little perspective.